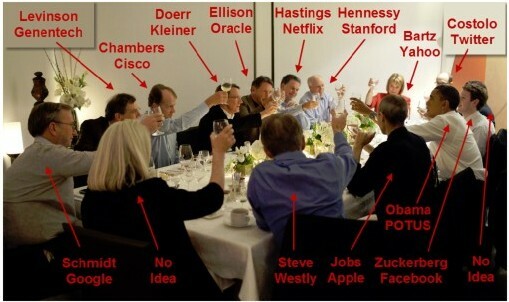 Obama’s Silicon Valley “Tech Supper” – Who Sat Where? Why Was He There? These are the questions being debated this morning about Obama’s visit last night to the home (dare I say “lavish Woodside estate”) of tech investor and Google board member John Doerr. Stanford University President John Hennessy (also a Google board member) was present and so was Google CEO Eric Schmidt, but not incoming Google CEO Larry Page.